If you’re an avid gamer, and you’re always on the lookout for new games to play, you’ll definitely appreciate a good deal. With the help of the Internet, deals aren’t all that hard to find. In fact, there are hundreds of websites that crop up when you do a Google search for a certain game. But, having to sift through so many websites, all offering their own version of the best deals, you might waste more time browsing them than you could have spent purchasing and playing a game. For gamers who want to see all the best deals in the palm of their hand, there’s an app tailored specifically for your needs. 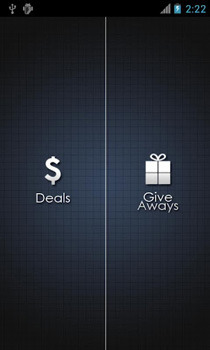 Developed by Ogma Labs, Game PromoBox is a free Android app that lets you view and share exclusive offers and giveaway announcements from various popular online game distributors. These distributors include GamersGate, Green Man Gaming, Impulse, Desura, and Beamdog. Imagine being able to find all the best deals–all from your Android device. You won’t need to visit website after website since Game PromoBox, with its sleek interface, brings all the best deals to you. Look around for that game that you’ve always wanted and you might just find yourself walking away with not just one game, but two or more. If you’d like to keep up to date with the hottest gaming deals in your location, tap on the Menu key and then Settings to specify your country code. You won’t have to keep tapping that Refresh button since Game PromoBox automatically updates its contents. If you’re looking to save your phone’s battery and your limited data plan, you can also specify the automatic update to work only over Wi-Fi. That way, Game PromoBox doesn’t have to consume energy when you don’t need it to. 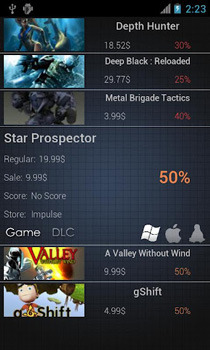 After you’ve installed Game PromoBox on your Android device, you’ll see that Game PromoBox’s interface is split into two. Tap the left side to see game deals and check the latest price drops and discounts. You can even check a game’s current price and its sale price. 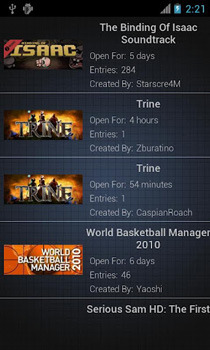 If you’d like to check ongoing giveaways, tap the right side (giveaways icon). You’ll see for how long each giveaway is valid, as well as who’s offering it and how many entries it has received so far. If you’ve found a deal that you’d like to share with your friends, long-press on an item. Who knows, maybe it’s a deal they’ve been looking for as well. Long-pressing also brings you to the game deal’s website if you’d like to browse around it more. Though Game PromoBox performs very well, one feature that it doesn’t seem to support is the option to change the displayed currency to other types. Users have their fingers crossed that this feature may find its way in future updates, but for now, the developers have already promised deal filters and a wishlist notification features. 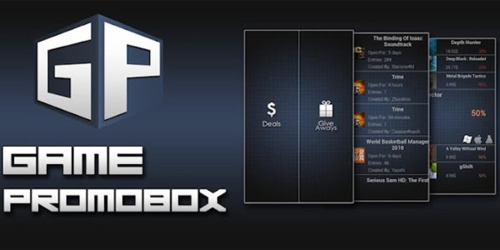 If you’d like to start looking for the latest deals for PC, Mac and Linux games, you can download Game PromoBox from the Google Play Store for free.